Washington, DC | www.adc.org | April 9, 2018 | ADC is urging members and supporters to email their representatives and demand they publicly condemn Israel’s use of live-fire against Palestinian civilian demonstrators. ADC urges you to email your Congresspersons and politely but firmly demand that they speak out against Israel’s deadly attacks on civilians. Demand to know why they continue to fund Israel’s military in violation of U.S. law that prohibits aid to human rights violators (known as the Leahy Law). Ask them: Is the gunning down of civilians demonstrators not evidence of human rights violations? For the past two weekends, thousands of Palestinians in the occupied Gaza Strip have joined demonstrations to protest the suffocating Israeli blockade. Israel prevents the delivery of many basic food staples and has publicly stated that its objective has been “to put the Palestinians on a diet.” This inhumane policy has had an incalculable toll on Gazans. Today, more than a million Gazans need emergency food assistance from the UN. To this basic human desire to be free, Israel has used live ammunition against peaceful protestors. The Israel Defense Forces chief of staff authorized 100 snipers “to use a lot of force” against the unarmed protestors. A bloodbath has ensued that reflects Israel’s longstanding treatment of Palestinians lives as disposable. 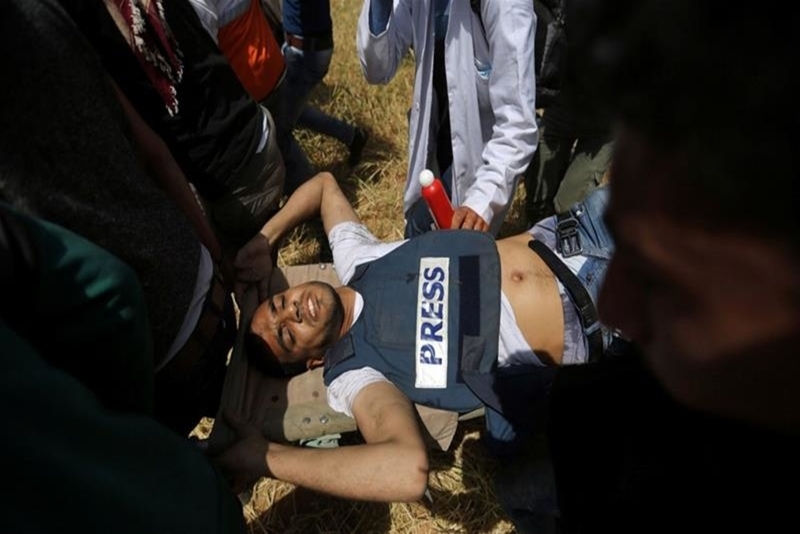 Videos have emerged of Israeli snipers shooting down teenagers in an open field, a journalist wearing a PRESS jacket (Yaser Murtaja, 30, who died from his wounds; see photo above), a young man while he was praying and other innocent people. In the past two weeks, nearly 40 Palestinians have been killed and over 1,000 injured. It is important that you write your Congresspersons to voice your opposition to Congress’s permissiveness toward Israel’s crimes. It is vital that members of Congress know that many of their constituents are paying attention, outraged, and demanding action. Stand up for Gaza now! The video below provides more information and dramatizes the horror Israel is inflicting on Palestinians.